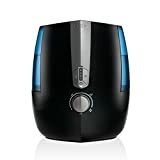 WARM AND COOL MISTING OPTION: The Ultrasonic Humidifier by HoMedics features a warm and cool misting option. Customize your comfort with cooling mist during dry, hot summer months. Choose the warm mist setting during cold winter months to breathe easier, soothe a cold or flu, and prevent chapped lips or skin. Adjust the intensity of the mist with the easy-to-use control buttons. Its 1.4 Gallon Tank has a runtime of up to 65 hours!